Thanks for nominating for an ALW2018 scholarship. 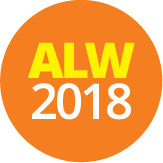 We will be distributing nominee stories through our #ALW2018 social media platforms in the lead up to the Week. Scholarship winners will be announced during Adult Learners’ Week (1–8 Sept).